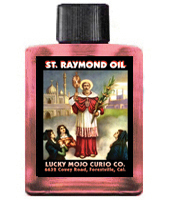 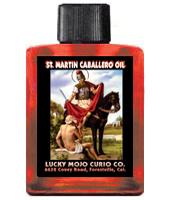 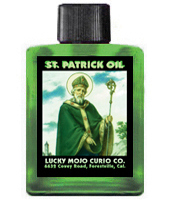 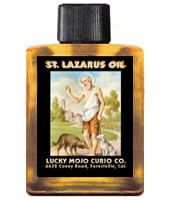 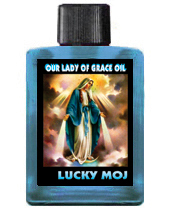 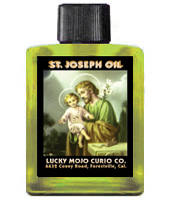 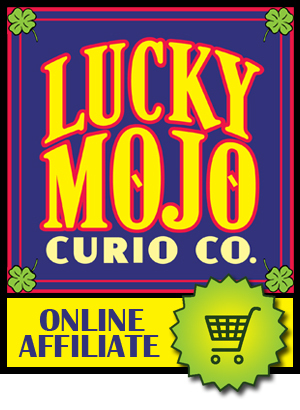 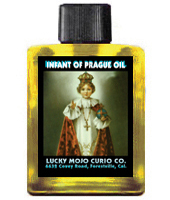 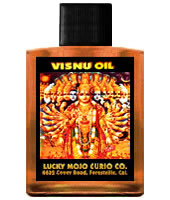 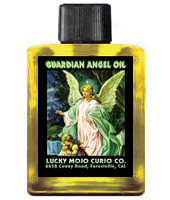 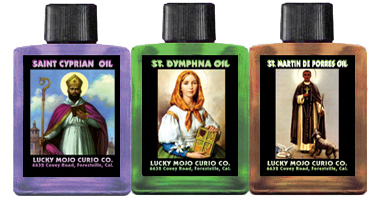 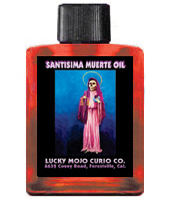 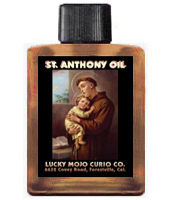 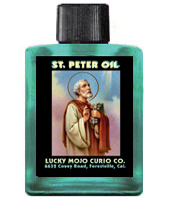 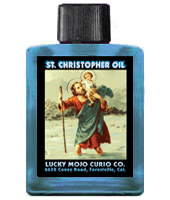 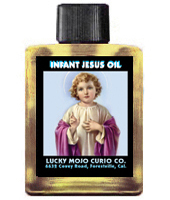 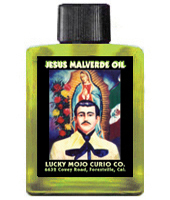 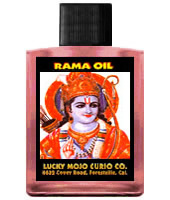 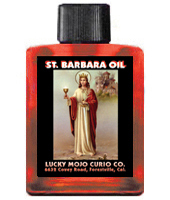 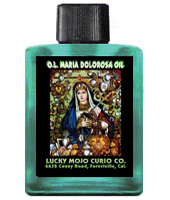 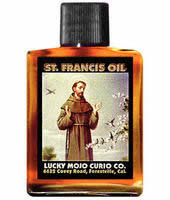 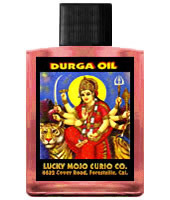 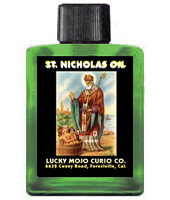 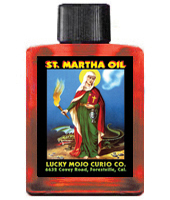 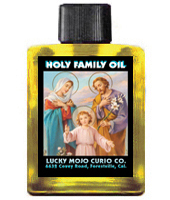 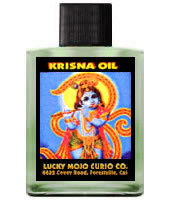 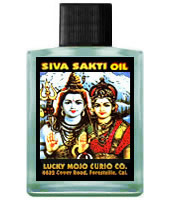 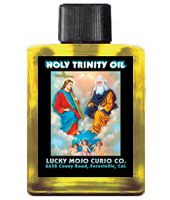 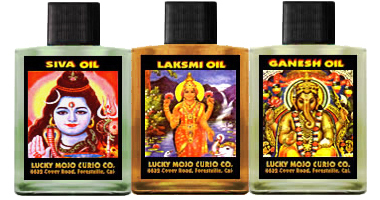 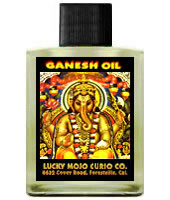 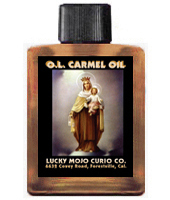 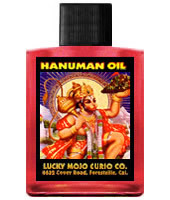 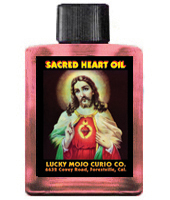 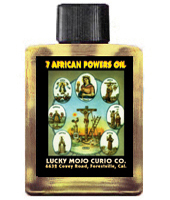 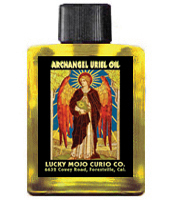 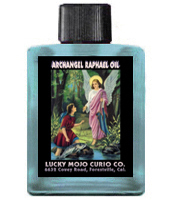 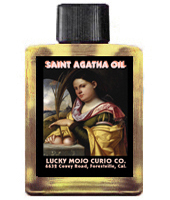 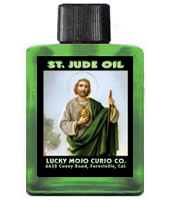 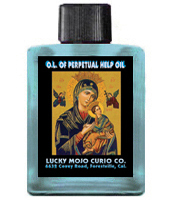 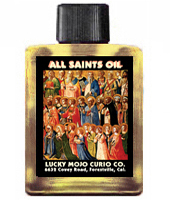 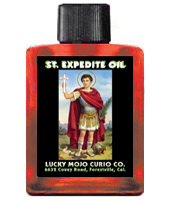 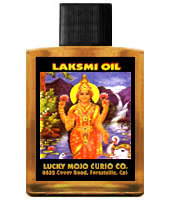 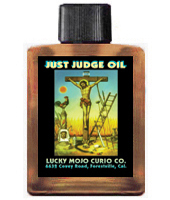 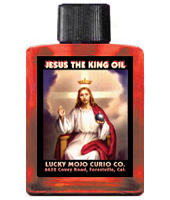 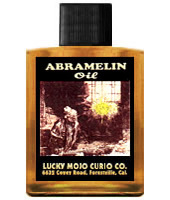 Lucky Mojo Brand religious and spiritual oils are made with pure essential oils cut to a skin-safe level with natural Almond Oil as a carrier oil. 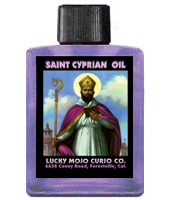 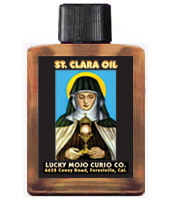 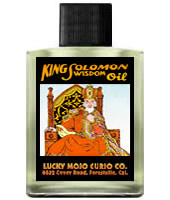 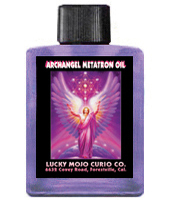 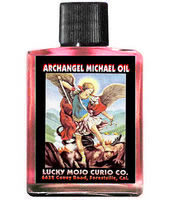 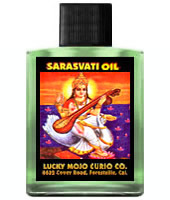 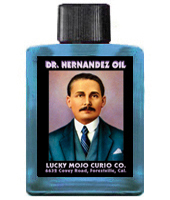 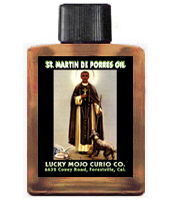 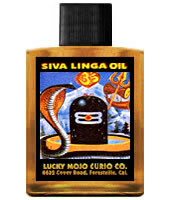 They may be blended with one another or added to any other Lucky Mojo oils to create custom blends for many years. 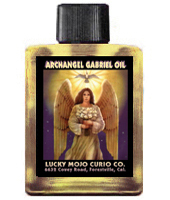 • See All Archangel Gabriel Oil Spiritual Supplies For Sale at the Lucky Mojo Curio Co.
• See All Archangel Metatron Oil Spiritual Supplies For Sale at the Lucky Mojo Curio Co.
• See All Archangel Michael Oil Spiritual Supplies For Sale at the Lucky Mojo Curio Co.
• See All Archangel Raphael Oil Spiritual Supplies For Sale at the Lucky Mojo Curio Co.
• See All Archangel Uriel Oil Spiritual Supplies For Sale at the Lucky Mojo Curio Co.
• See All Guardian Angel Oil Spiritual Supplies For Sale at the Lucky Mojo Curio Co.
• See All Holy Family Oil Spiritual Supplies For Sale at the Lucky Mojo Curio Co.
• See All Holy Trinity Oil Spiritual Supplies For Sale at the Lucky Mojo Curio Co.
• See All Nino de Atocha Oil Spiritual Supplies For Sale at the Lucky Mojo Curio Co.
• See All Infant Jesus Oil Spiritual Supplies For Sale at the Lucky Mojo Curio Co.
• See All Infant of Prague Oil Spiritual Supplies For Sale at the Lucky Mojo Curio Co.
• See All Jesus Christ the King Oil Spiritual Supplies For Sale at the Lucky Mojo Curio Co.
• See All Sacred Heart of Jesus Oil Spiritual Supplies For Sale at the Lucky Mojo Curio Co.
• See All Just Judge (Justo Juez) Oil Spiritual Supplies For Sale at the Lucky Mojo Curio Co.
• See All Mano Poderosa (Powerful Hand) Oil Spiritual Supplies For Sale at the Lucky Mojo Curio Co.
• See All Seven African Powers Oil Spiritual Supplies For Sale at the Lucky Mojo Curio Co.
• See All Anima Sola (Lonely Soul) Oil Spiritual Supplies For Sale at the Lucky Mojo Curio Co.
• See All Saint Agatha Oil Spiritual Supplies For Sale at the Lucky Mojo Curio Co.
• See All Saint Anthony Oil Spiritual Supplies For Sale at the Lucky Mojo Curio Co.
• See All Saint Barbara Oil Spiritual Supplies For Sale at the Lucky Mojo Curio Co.
• See All Saint Christopher Oil Spiritual Supplies For Sale at the Lucky Mojo Curio Co.
• See All Saint Clara Oil Spiritual Supplies For Sale at the Lucky Mojo Curio Co.
• See All Saint Cyprian Oil Spiritual Supplies For Sale at the Lucky Mojo Curio Co.
• See All Saint Dymphna Oil Spiritual Supplies For Sale at the Lucky Mojo Curio Co.
• See All Saint Expedite Oil Spiritual Supplies For Sale at the Lucky Mojo Curio Co.
• See All Saint Francis of Assisi Oil Spiritual Supplies For Sale at the Lucky Mojo Curio Co.
• See All Dr. Jose Gregorio Hernandez Oil Spiritual Supplies For Sale at the Lucky Mojo Curio Co.
• See All Saint Joseph Oil Spiritual Supplies For Sale at the Lucky Mojo Curio Co.
• See All Saint Jude Oil Spiritual Supplies For Sale at the Lucky Mojo Curio Co.
• See All Saint Lazarus Oil Spiritual Supplies For Sale at the Lucky Mojo Curio Co.
• See All Jesus Malverde Oil Spiritual Supplies For Sale at the Lucky Mojo Curio Co.
• See All Saint Martin Caballero Oil Spiritual Supplies For Sale at the Lucky Mojo Curio Co.
• See All Saint Martin de Porres Oil Spiritual Supplies For Sale at the Lucky Mojo Curio Co.
• See All Saint Martha the Dominator Oil Spiritual Supplies For Sale at the Lucky Mojo Curio Co.
• See All Santisima Muerte (Holy Death) Oil Spiritual Supplies For Sale at the Lucky Mojo Curio Co.
• See All Saint Nicholas Oil Spiritual Supplies For Sale at the Lucky Mojo Curio Co.
Mexican folk-saint and healer of the 19th and 20th centuries. 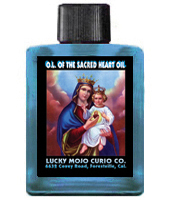 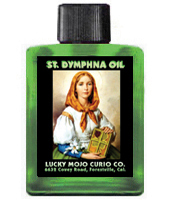 • See All Nino Fidencio Oil Spiritual Supplies For Sale at the Lucky Mojo Curio Co.
• See All Saint Patrick Oil Spiritual Supplies For Sale at the Lucky Mojo Curio Co.
• See All Saint Peter Oil Spiritual Supplies For Sale at the Lucky Mojo Curio Co.
• See All Saint Raymond (San Ramon) Oil Spiritual Supplies For Sale at the Lucky Mojo Curio Co.
San Simon Esencia Maximon Magical Perfume, 1/2 oz. 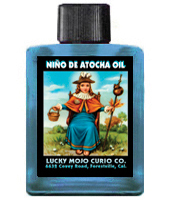 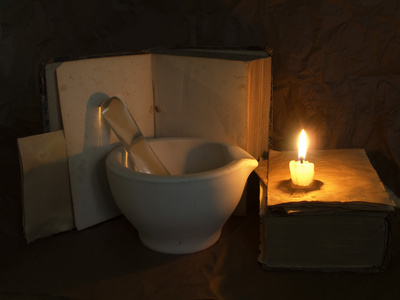 Technically, this is not an OIL but a "magical perfume" made according to an ancient Mayan formula Patron of Guatemala; ancient Mayan god represented as a black-suited peasant; for luck and protection. 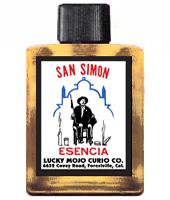 • See All San Simon Esencia Maximon Magical Perfume, 1/2 oz. 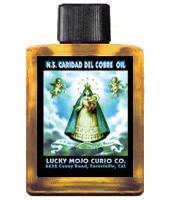 Spiritual Supplies For Sale at the Lucky Mojo Curio Co.
• See All All Saints Oil Spiritual Supplies For Sale at the Lucky Mojo Curio Co.
• See All Our Lady of Caridad del Cobre Oil Spiritual Supplies For Sale at the Lucky Mojo Curio Co.
• See All Our Lady Maria Dolorosa Oil Spiritual Supplies For Sale at the Lucky Mojo Curio Co.
• See All Our Lady of Grace Oil Spiritual Supplies For Sale at the Lucky Mojo Curio Co.
• See All Our Lady of Guadalupe Oil Spiritual Supplies For Sale at the Lucky Mojo Curio Co.
• See All Our Lady of Loreto (Loretto) Oil Spiritual Supplies For Sale at the Lucky Mojo Curio Co.
• See All Our Lady of Mount Carmel Oil Spiritual Supplies For Sale at the Lucky Mojo Curio Co.
• See All Our Lady of Perpetual Help Oil Spiritual Supplies For Sale at the Lucky Mojo Curio Co.
• See All Our Lady of the Sacred Heart Oil Spiritual Supplies For Sale at the Lucky Mojo Curio Co.
• See All Durga Oil Spiritual Supplies For Sale at the Lucky Mojo Curio Co.
• See All Ganesh Oil Spiritual Supplies For Sale at the Lucky Mojo Curio Co.
• See All Hanuman Oil Spiritual Supplies For Sale at the Lucky Mojo Curio Co.
• See All Kali Oil Spiritual Supplies For Sale at the Lucky Mojo Curio Co.
• See All Krisna Oil Spiritual Supplies For Sale at the Lucky Mojo Curio Co.
• See All Laksmi Oil Spiritual Supplies For Sale at the Lucky Mojo Curio Co.
• See All Rama Oil Spiritual Supplies For Sale at the Lucky Mojo Curio Co.
• See All Sarasvati Oil Spiritual Supplies For Sale at the Lucky Mojo Curio Co.
• See All Siva (Shiva) Oil Spiritual Supplies For Sale at the Lucky Mojo Curio Co.
• See All Siva Linga Oil Spiritual Supplies For Sale at the Lucky Mojo Curio Co.
• See All Siva Sakti (Shiva Shakti) Oil Spiritual Supplies For Sale at the Lucky Mojo Curio Co.
• See All Lord Visnu (Vishnu, Bisnu) Oil Spiritual Supplies For Sale at the Lucky Mojo Curio Co.
• See All Any 12 Hindu Oils Mixed Dozen Spiritual Supplies For Sale at the Lucky Mojo Curio Co.
• See All Moses Oil Spiritual Supplies For Sale at the Lucky Mojo Curio Co.
• See All Abramelin Oil Spiritual Supplies For Sale at the Lucky Mojo Curio Co.
• See All King Solomon Wisdom Oil Spiritual Supplies For Sale at the Lucky Mojo Curio Co.